Skiers, part 4 of 10—the show (including stunts, funny incidents, and salary). What mistakes or accidents happened during a show? Andy Hansen: LOL, a lot of costume funnies. 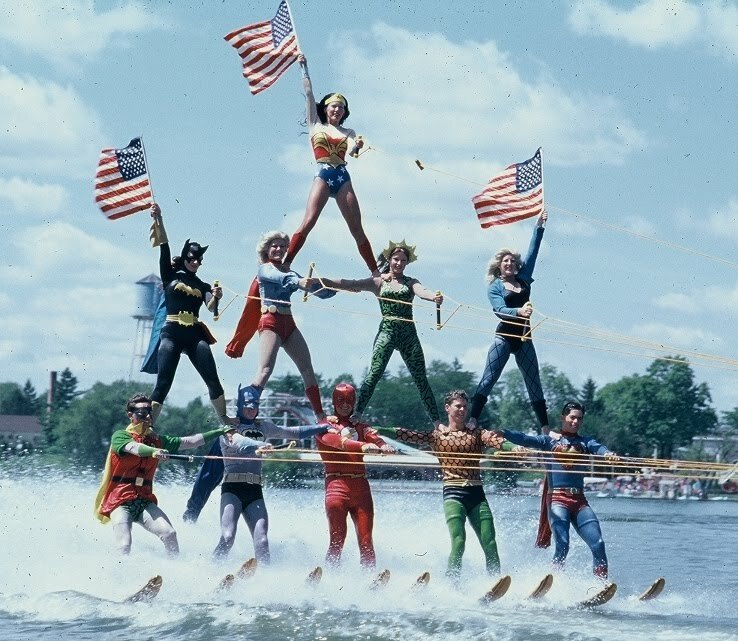 When a water skier fell, it would be “non-superherolike,” so that would create some humor. Some announcers were better than others at covering errors. Jimmy Olsen was the announcer character. Tom Freeburn was one of the best at it. He was very animated and a good communicator. Bill Peterson: Pyramid fall, star double falls, jump falls, barefoot falls. Accidents usually were knee injuries, but the most dangerous falls were when the top girl in the pyramid would fall into the ropes. Could possibly result in a serious injury if she were to become tangled in the ski ropes of the other skiers. It did happen, I think only once. But when it did everyone went down like a domino effect. So everything stopped until everyone got untangled and was seen to be okay. Falls in the kite could be fatal. Andy Hansen had an almost fatal fall in a kite once. I was hit in the head a few times by skiers accidentally running over me during a fall. No one was seriously injured when I was there, but the fear made us all extra-cautious. Bill Schwartz: If it was an acting error, we just continued. The audience wouldn’t even notice. 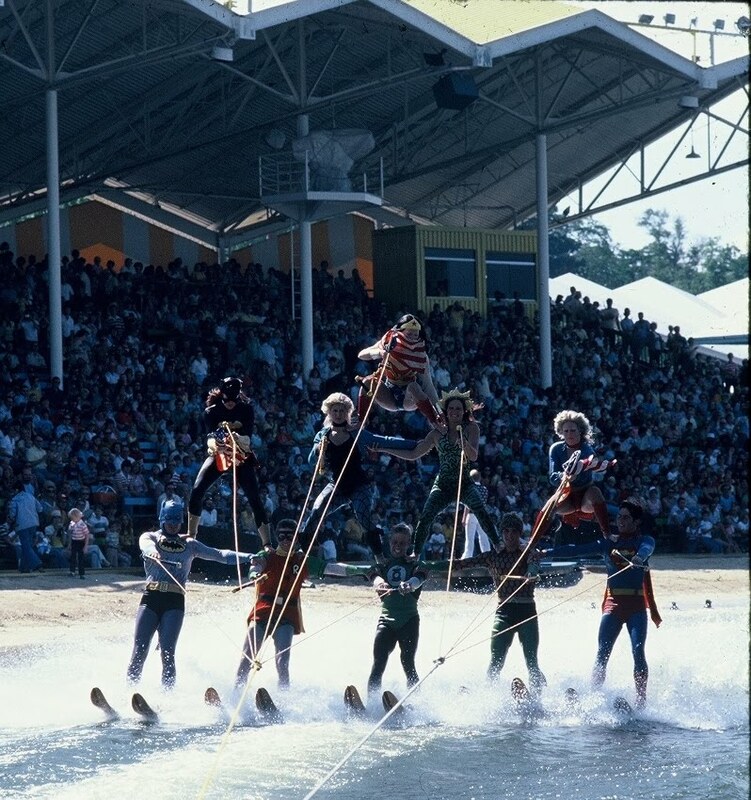 If one of the star water ski acts would fall, the announcer would ad-lib, explain the difficulty in the act, and the skier/skiers would re-perform the act. Bubby Snow: Superman’s wig falling off was the most common. Carl Lipsit: Kite flying was probably the most dangerous (I didn’t fly the kite). It was a relatively small lake and it was difficult to get the kite to the proper altitude. Kite would get locked in a climb position until power was dropped from the boat. Had to be monitored very closely. There were standard hazards such as hitting a ski that was left in the water, someone falling unintentionally to the front of a human pyramid, motor problems that caused slow starts/heavy strain when a pyramid group left the docks, ropes snapping when doing an “around the world,” and, of course, just taking some good tumbles when barefooting or, in particular, in one scene where three people barefooting tried to wipe the others out and be the last man standing. Diane Smith: Scenarios requiring not only acting but athletic abilities were even more unpredictable [than traditional live theater]. You have more variables in this type of show, including the weather, technical mishaps [with the boats, etc. ], [and so on]. We all learned to camouflage the errors. We had a saying: “If the Flash fell” in the opening act, it was an omen and we should “be vigilant for subsequent falls.” The most that usually happened was to begin a great show with audience attention and excitement, only to have that show held or cancelled due to lightning (and even an approaching tornado at one time). [During one] night show, the lights in the entire park suddenly went out. With no moonlight, we were in absolute darkness. There were other boats on the water. If a skier had fallen [into] the lake, the boat drivers would not be able to see that person and could hit the skier with the boat. Also, there were skis in the water which the pick-up boat had yet to retrieve from acts which dropped their skis mid-performance. 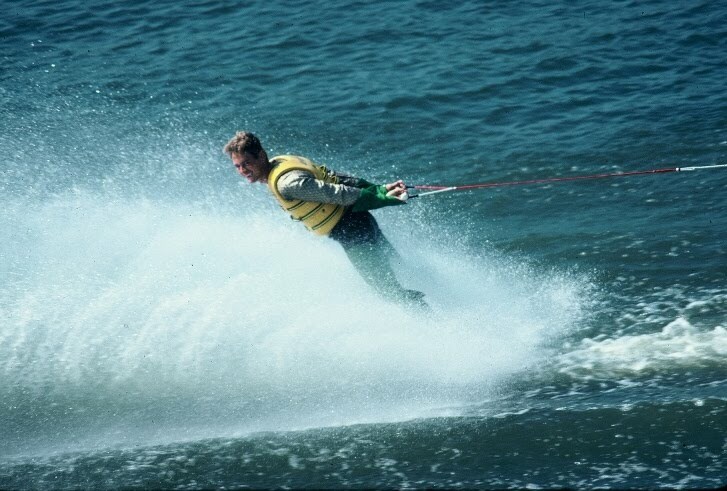 If a skier then on the water were to hit a ski, it would probably knock that person into the water. [When it went dark, the] ballet line was performing on the lake. We had just made our first pass, engaged in arm (with the ropes between our knees) and leg ballet movements. I was the first girl (of six or more) in the line, and thus had the responsibility to cut hard and strong enough so as to bring in all the girls and have a perfect beach landing. You wanted to land and enter the beach at the water’s edge, just lightly enough to touch the sand, jump out of your ski, and then make a graceful bow to the audience. But I could not see the beach and I could not judge when to cut into the beach or how hard to pull and swerve to bring the line in uniformly. I used my best judgment, but the beach was closer than I thought. You see, even the boat driver with his bow light on could not see how close he should drive us as we circled to approach the stage. I pulled and we landed roughly, tumbling too far up in the sand to jump out of our skis, but fortunately, short of the solid barrier. No girl had fallen in the lake and we were all safe. Of course, the remainder of the show was cancelled and this situation was an anomaly. Never did a [show] event frighten me as much as that show in the eerie darkness. Doby Buesse: A “no-fall show” was common. A “no-fall day” was rare. 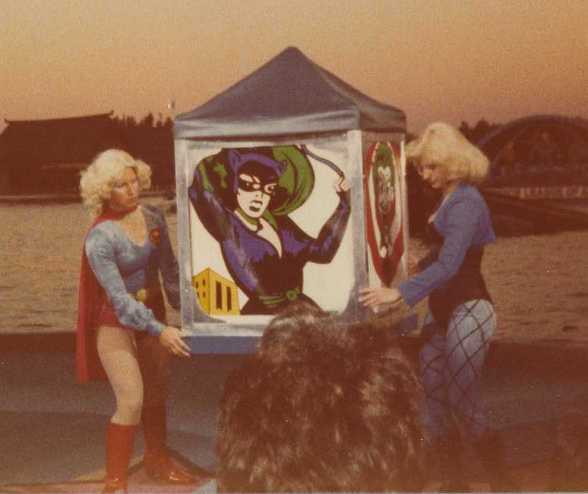 Jacque Cook (Kuntarich): One time I was doing an around-the-boat and you had a cape and cowl. I got clotheslined and my cape wrapped around the rope. Somehow in the fall a skier ran over my head. I kept saying “I can’t see!” The pub (pickup) boat came. If somebody fell, you had to a pay a quarter into this petty cash thing. Then we went to buy drinks with it at the end of the month. If there was a fall it was checked. You got paid according to how many acts you could do. You had to be consistent. There were days when we hadn’t fallen in days and days. 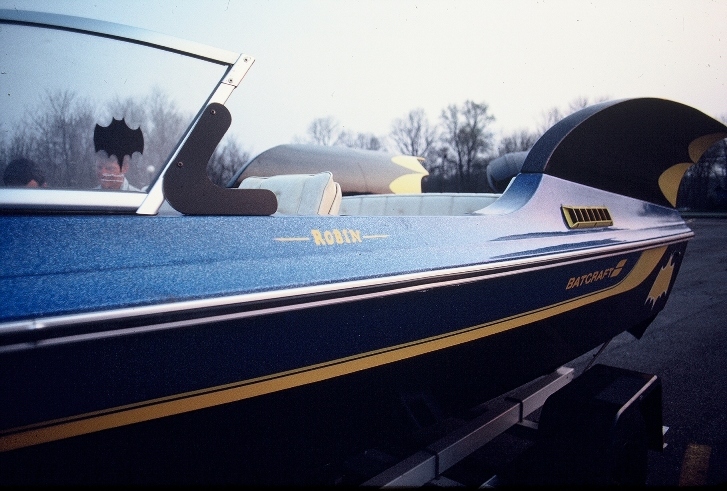 Once when we went to take off from the floating dock set, the boat cavitated. It pulled me off the dock. I tried to save [the move] but I somehow kicked myself in the face with my slalom ski and broke my right cheekbone. Back then they didn’t have an ambulance waiting for us. Betsy drove me (still in the Batgirl costume) to the ER and kids said “Look, mommy, it’s Batgirl.” I had a concussion and the doctor said what’s wrong and I kept saying “I’m Batgirl.” Betsy hurt her ankle as Batgirl, too, and went to the hospital. While there, a doctor asked her if she’d go say hi to kids in another room. Janalee Zimmerman (Addleman): Towards the end of the season, I was practicing a lift with one of the guys and during that practice on land I dislocated his shoulder. :-( I can’t remember his name, though. Jeff Parnell: If you fell in an act, right after the show you went out and practiced until you did right several times. The guys started a fall fund—50 cents a fall and at the end of the summer we had a party. Kaci Whittenton (Hedstrum): There were the obvious falls and some leading to broken bones, injured knees, and cuts. But the most memorable for me was Andy Hansen’s kite-flying accident between shows. The kite collapsed and he fell (don’t remember how many feet—it was a lot) into the water causing neck and head injury. They had to cut him loose from the submerged kite. Scary! I think there was a death that occurred during the boat opening act, but I was not working there at the time and I don’t know the details. Kerry Lloyd: Only people-error—people fall, not paying attention because they get complacent over time. They ski right into shore waving to girls. Mark Gutleben: Bob Borth was the number one hotshot at the time, I thought. But the only thing he had over on me is they let him fly the kite. I guess the director was scared to let me do it—too wild. I had a boating accident here in 1980 and some guy hit me and put me in a coma. I feel a lot better than I did back then! Nancy Radant Combes: One time I ruined a disappearing act for Black Canary. She was supposed to go into a kiosk and after the blinds were pulled down she would slip through a hole in the stage, change into a thug costume, and crawl out a tunnel. It had rained severely the night before and someone forgot to bilge out the tunnel. When I went to drop down, it was full of water and I refused to drop into the tunnel and “swim” out. So when the shades were opened, Black Canary was still there. I just screamed and ran off stage. My boss wasn’t too happy. Paula Nelson (Bloemer): A stalled engine in front of a crowded stand can be a bit embarrassing. With the sometimes inhumane number of shows they scheduled, mistakes happened. The one I most clearly remember happened while I was playing Supergirl. In the show Supergirl and Superman take off on slalom skis and cut out hard in opposite directions, then the boat spins out doing a 360-degree turn . Now Superman and Supergirl are heading towards one another; Supergirl ducks down (which I did) and Superman lifts his rope up to avoid hitting Supergirl. However, one day one of the Supermen (I won’t name names) had imbibed some sort of “kryptonite” cocktail and did not lift his rope up. Luckily, Supergirl was not beheaded in front of the audience! I had a nice welt across my cheek for awhile, but nothing permanent. Randy Messer: Kite flying was the most dangerous. [Perhaps a] skier forgets to clip his harness into the kite and the kite takes off without him. This happened to Tom Weber in Ohio. The kite took off beautifully without him and then a couple hundred feet up it crashed onto the roof over the ski stadium filled with audience. Fortunately no one was hurt. There may even be footage of this. [Perhaps the] kite goes up but the pull from boat is too much and something on the kite breaks. This happened to Andy Hansen. We were both getting in practice pulls. I’d just flown and was being ferried back to the takeoff area in the pick-up boat when Kerry Lloyd yelled that Andy had crashed. Andy’s kite had folded up and he’d plummeted into the lake. He hit hard and the broken kite wrapped around him making it difficult to get to him. There is sail, cables, rope, harness material, floats on the kite all in the way of a rescue. He was pulled out of the water. The helmet he’d worn had bucketed and the strap nearly strangled him. There was a short time no one knew if he would survive. Everyone was very shook up. The driver was devastated; he’d driven kites before at Cypress Gardens and was competent. This all led to Sea World restricting kite flying to Gary and eventually removing it from the show. Equipment and safety standards were not nearly what they were a few years later; it was still a fairly new sport in the late ‘70s. Years later I nearly drowned after a kite broke on takeoff and left me in six-and-a-half foot water with a kite spread on top of me. Being only six feet tall, I could touch the bottom but not push up high enough to get air. I unclipped my harness and wriggled through cables until I could swim free. Anyone could jump a boat; not a lot of skill required. We all loved jump boats; you could chime it and send up big walls of spray, soaking each other and even soaking the crowd, which we were constantly warned not to do. There were a few close calls—a few skiers were ejected from the boats. Somewhere there is a great video showing a skier thrown out and almost run over by another boat. The piece was being filmed for a promo for the Ohio park. Years later a jump boat went into the crowd in the Ohio park. Jump act consisted of Superman, Green Lantern, Flash, and Aquaman. There were many crashes in jump acts and when we fell, the announcer often blamed it on villain treachery. It would be very embarrassing skiing into stage after a bad act. Harry Blackstone brought in the magic acts and we were all sworn to secrecy. Sawing a person in half, vanishing act, mixing body parts, and a cheese press with real spikes that really could kill someone if released improperly. It did spike Robin’s cape one time and when it came time for him to pop up and say his lines, he was struggling to free himself. The stage had trap doors with tunnel leading to back of the stage by the beach. Once in heavy rains the tunnel filled up and the female performer who dropped through the trap door found herself underwater and had to swim out thru the tunnel. There were some heroics along the way. Shirley Duke: Sometimes the three-high pyramid would fall. After the conclusion of the show as the audience was leaving, we’d have to rebuild it; it was a highlight that the audience was looking forward to. Sherry Wickstrom: Once Wonder Woman forgot to put on her magic rope. One practice of the pyramid on water we fell. The boat driver took the corner too tight. Some of the girls went forward, I went back. Someone said that as we went down, we looked like we were flying. Next: skiers, part 6 of 10—the audience; the fame. Posted 7:38 AM Labels Sea World, series: Super '70s and '80s, superheroes, where are they now? These posts could be their own book, or some sort of insert to DC comics, or something!